As you may have noticed by now, I am a lover of all types of sandwiches, hot or cold, vegetarian or meaty, American, Asian or Italian. Although I usually settle for a classic turkey avocado, every so often I whip up a fancier sandwich. 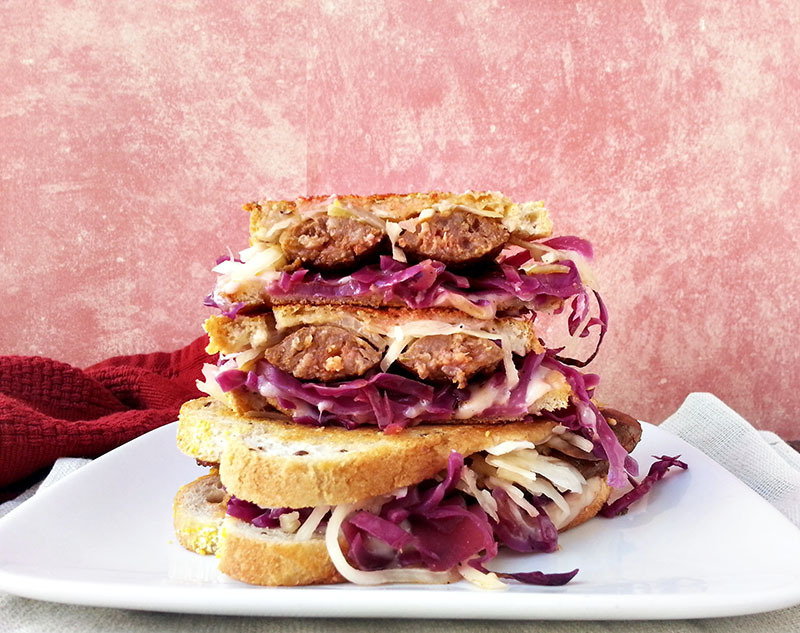 This latest creation is a play on the Reuben, adding a spicy bratwurst to the mix and replacing sauerkraut with braised cabbage with apple. The substitutions are simple but the results are outstanding – a great way to still enjoy a Reuben but with a twist! 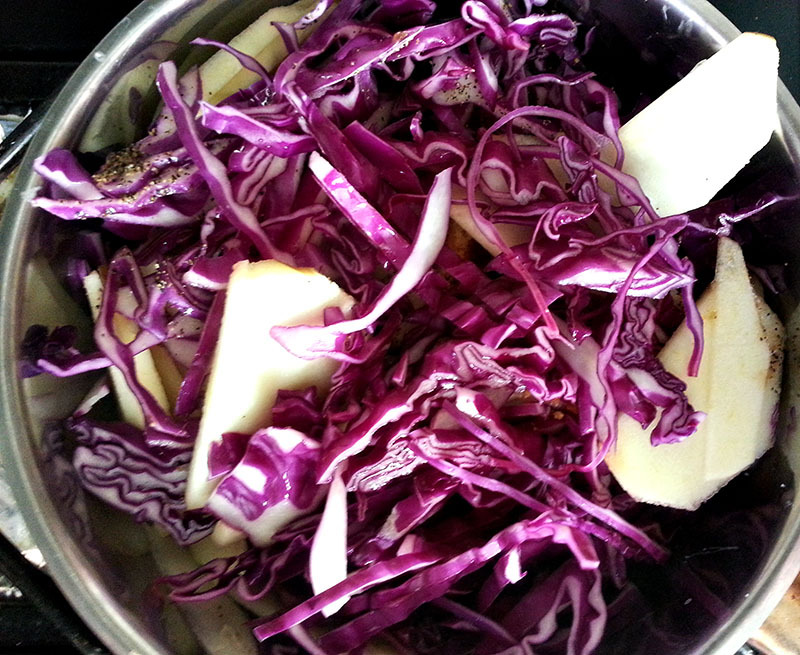 Place all ingredients for braised cabbage from cabbage - brown sugar in a medium size pot. Cover and bring to a boil over high heat. Reduce heat to medium - low and simmer with the cover partially opened for 25-30 minutes or until cabbage and apple are tender. 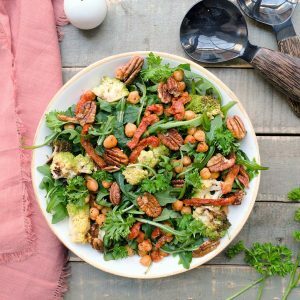 Mix together ingredients for Russian dressing from sour cream - paprika in a small bowl. Set aside. Place fresh bratwurst in a pot and cover with water. Bring to a simmer over medium heat and cook through. Remove sausages with a slotted spoon, discarding water. Slice sausages lengthwise. Heat 1 tsp oil on a griddle or nonstick pan over medium heat. Add the sliced sausages and brown on both sides until browned, about 2-3 minutes. Remove from heat and set aside. Wipe the griddle or pan clean. Spread butter on one side of the rye bread. Spread Russian dressing on the other side. Layer 1 slice cheese, 1 1/2 sausages, cabbage and another slice of cheese on the side with the Russian dressing. Stack the remaining bread, buttered side facing out. Repeat with other sandwiches. 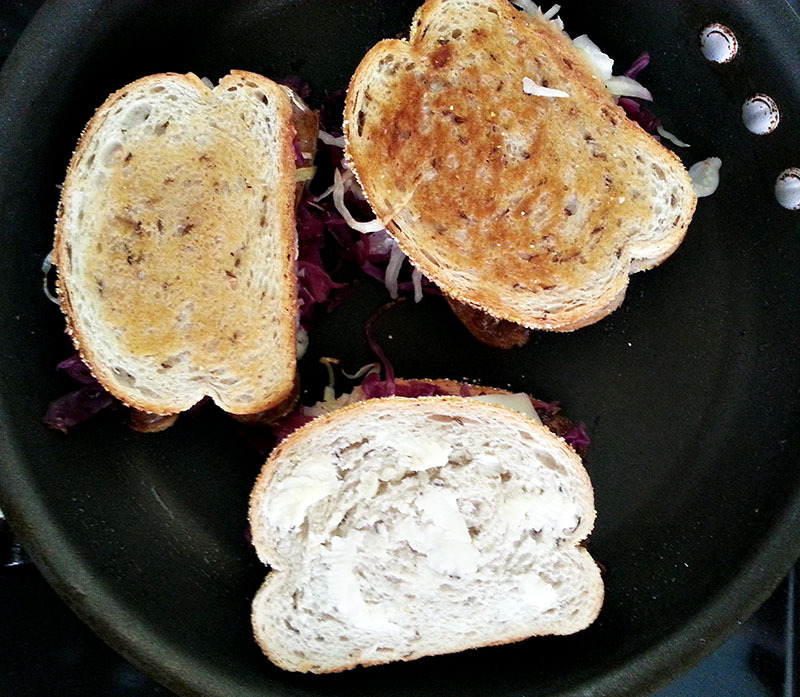 Grill sandwiches on a warm pan over medium-low heat until cheese has melted and bread is golden brown. Slice and serve. The classic Reuben consists of corned beef, swiss cheese, sauerkraut and Russian dressing all on rye bread. I’ve made variations using pastrami and roast beef, but I never thought to use sausages until now. You can use original bratwurst, sweet, or mild but I personally love the spicy version. Start by making the braised cabbage with apple since it takes the longest. It may seem like a large amount but the cabbage will shrink as it cooks down. When heating the sandwiches, butter the bread to help it get nice and golden. A griddle would be ideal for finishing the sandwiches but you can also heat a pan on low heat for the same results. 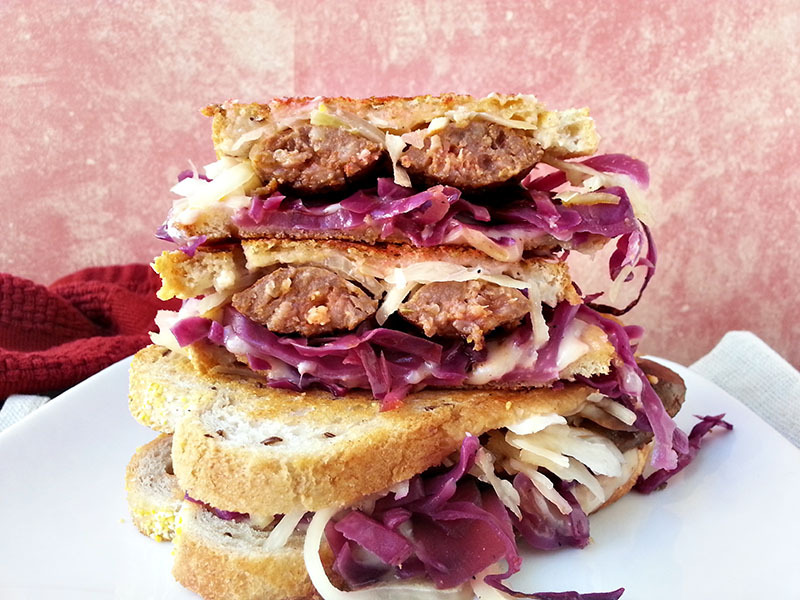 Just like the classic Reuben, this bratwurst version has the tangy element from the cabbage, salty from the sausage and savory from the swiss cheese. The apples complement all of the components of the sandwich while the Russian dressing adds a bit of creaminess. All in all, a great twist on the classic Reuben! This looks amazing! 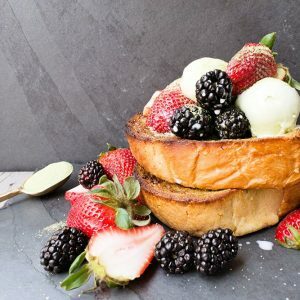 What a great blog! I am so glad I stopped by!